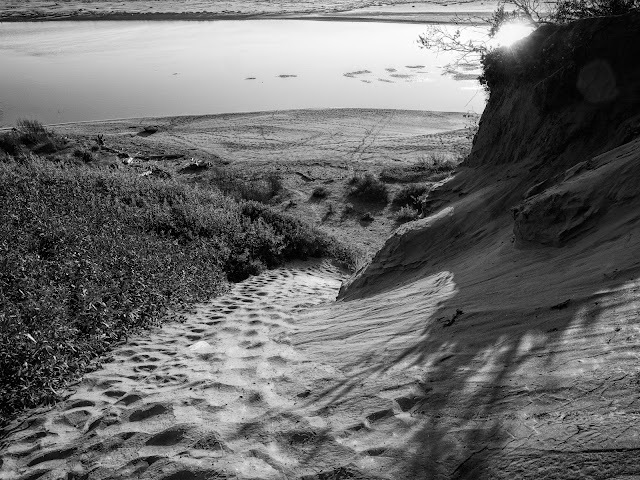 Continuing the black and white kick I'm on currently we have this sandy and fairly steep path down. The timing wasn't great, I'm here an hour before golden hour and with a very strong sun, so I had to frame accordingly. This is a river or creek (the maps go back and forth as to the naming) that merges with the ocean. At this point I'm about a half mile from the ocean, and with all that water with a strong sun there's a lot of glare.